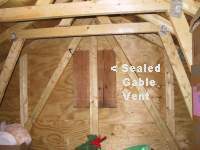 Attic ventilation repairs reduce moisture and mold problems! Sometimes even reputable contractors unwittingly execute uninformed and ill-advised construction practices, leading to serious health problems for homeowners, ultimately leading to costly and time-consuming litigation, where everyone losses, except the lawyers. Fortunately, this article has a happy ending, but not without effort and compromise on the part of all parties involved. As a prelude to this story - less than one year earlier, the subject home had sustained serious fire damage, requiring that the entire roof structure, including the roof trusses, roof sheathing and roof shingles be totally replaced. A fire reconstruction specialist was hired to complete the restoration. All of this work was done in accordance with specifications provided by the homeowner's insurance company, with additional special directives given by the original homeowner. Unfortunately, both the insurance adjuster and the original homeowner directed the fire restoration contractor to complete the required restoration work to be exactly as it had been prior to the fire, a bad decision. 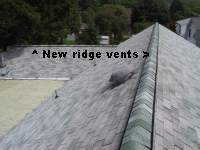 Those specifications and directives were flawed, causing this otherwise reputable contractor to install items now know by him to create serious environmental problems - problems compounded by the contractor's own unwitting recommendation to install two additional gable end vents. Mixing outlet vent types is now know and documented to be a construction practice no-no! If everyone reading this article learns one fact, it would be this - do not install several different kinds of outlet vents - if you have multiple outlet vents, choose the most efficient one and eliminate all of the other vents. Why? Because the more efficient outlet vent transforms the weaker outlet vent into an inlet vent. Air then simply short circuits between these two vents, eliminating the needed draw of air flow in from the soffits and then up along the roof sheathing. Shortly after completion of the fire restoration, the subject property was sold. 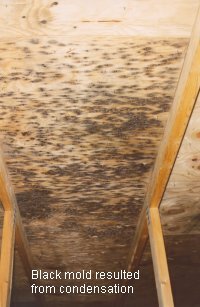 During the first winter after that fire restoration, the new homeowners observed the new plywood roof sheathing becoming dripping wet and beginning to buckle excessively, along with developing a serious black mold problem in the attic area - a mold problem for which one of the new homeowners was seriously allergic! His allergic reactions caused him to break out in hives and skin rashes, making him both uncomfortable and ill. The problem became so severe that he contacted an attorney to discuss litigation actions against this otherwise very reputable restoration contractor. The path had been set for a lose-lose construction litigation scenario. An inspector was subsequently hired by the attorney representing the restoration contractor to do a site inspection and report back to him with the findings, in an effort to identify the real issues involved with this potentially serious law suite. He did. 1st - The contractor agreed to remove insulation installed over and blocking the intermittent soffit inlet vents to the attic, thus allowing needed inlet fresh air flow into the attic space. 2nd - The homeowner agreed to compensate the contractor for installing additional soffit inlet vents where none currently existed, and to install additional soffit inlet vents where intermittent vents were present, thus providing adequate inlet airflow, originally denied by the insurance adjuster personnel. 3rd - The contractor agreed to block off the two, large, newly installed gable end vents with plywood, which he had earlier suggested for installation. Why? 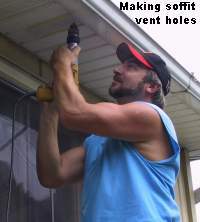 Because the power vent transformed the gable end outlet vents into inlet vents, stopping the necessary upward flow of fresh in from the soffits and along the roof's sheathing. This air flow is needed to eliminate condensation moisture - moisture needed by "mold" to grow! 4th - The contractor agreed to installing continuous, baffled, ridge vents along the entire intersecting gable roof line, originally denied by the insurance adjuster personnel. 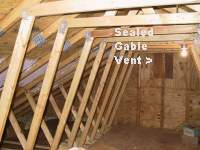 Baffled ridge vents are the most efficient form of exhaust air ventilation for attic spaces. Why? 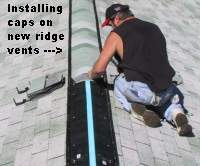 Because energy is not required to operate ridge vents. 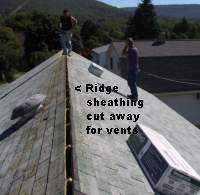 Noise is not generated by a ridge vent. And, wind blowing over the baffled-type ridge vents creates a negative pressure over that vent, much like that of an airplane wing, sucking out the heat and humidity from the attic in a very efficient and quiet manner. 5th - The homeowner agreed to seal off the power roof vent fan with plastic on the interior to eliminate interference with the upward pull of air by the baffled ridge vents from the soffit vents, thus keeping the attic air cool, dry and mold-free. Mold, like all living things, needs moisture to grow. Eliminate the moisture and you eliminate the mold! 6th - The contractor agreed to kill the existing mold with a bleach-based solution, topically applied, followed by sealing the affected surfaces with a sprayed paint sealant. The allergic homeowner is no longer subjected to mold allergies in his newly purchased home, the plywood roof sheathing is no longer wet and swollen, the air is flowing naturally in and out of the attic, the contractor is relieved to know that a problem has been eliminated, and no one is not spending excessive amounts of money and time on lose-lose litigation! 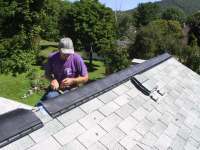 real estate inspector and roofing tools inventor.